May 22, 2015 - Union Wireless recently renewed their scholarship commitment supporting University of Wyoming undergraduate students within the College of Engineering and Applied Science. 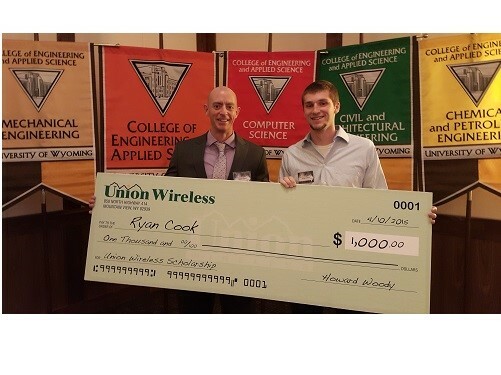 The two recipients of the 2015 Union Wireless scholarship were Ryan Cook, a freshman pursuing a degree in Computer Engineering, and Jacob Kirkland, a junior Computer Science. Both students were honored at the Tau Beta Pi Awards banquet held in Laramie on Friday, April 10th, 2015.